The .30-30 Winchester ammunition came to light in the late 1800s, designed to perfectly fit the Winchester Model 1894 lever-action rifle. This cartridge is famous and well-sought out as it was the first small-bore rifle cartridge, that is designed to hold smokeless powder. Initially, it was named the .30 Winchester Smokeless however after being chambered in the Marlin rifle, Marlin used the designation .30-30, where the -30 stands for the standard load of 30 grains worth of smokeless powder. Moving on to its uses, it is mainly utilized for deer hunting (fancy a deer hunting rifle?) due to its light recoil. Just so you know, most lever-action rifles (with tubular magazines) are the one that chamber this cartridge, hence why they are loaded with either flat-nose or round-nose bullets for safety. For your information, the most common lever-action rifles used to chamber these rounds are the well-known Winchester Model 1894 as well as the Marlin Model 336. Apart from that, you can either buy the ammo in bulks or the standard 20 rounds per box, according to your needs and personal preference. These rounds are arranged neatly in the box to ensure simple handling as well as easy transportation. 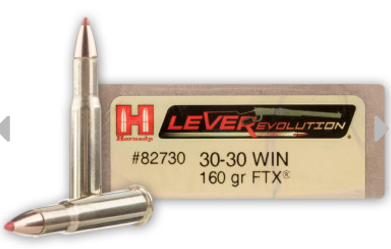 The Hornady Leverevolution may be difficult to pronounce, but this is a fantastic cartridge for lever action rifles. By creating a soft-tip elastomer at the tip of the bullet they removed the safety hazard of loading a pointed projectile in a tube loader. And since lever action rifles are still some of the most popular in the world, they’ve since reaped the benefits. The bullet weighs 160 grains. Heavier bullets contribute to higher muzzle velocity and energy hence resulting, in a more devastating result. That being said, heavier bullet weight is important especially for game hunting as you need deeper penetration in which the projectile needs to pierce through the animal’s flesh and hide to make its way to the vital organs, for a quick blow. Moving on, the projectile exits the muzzle and travels at 2400 fps, together with muzzle energy of 2046 ft lbs. Therefore, this ammo line basically delivers flatter trajectories for increased energy transfer as well as greater terminal performance. In other words, it is equipped with up to 40% more energy and 250 fps faster speed compared to the traditional flat point rounds. Apart from that, it features the Flex Tip technology (FTX). This technology is Hornady’s patented design in which the elastomer flex tip comes in handy to improve the ballistic coefficient significantly, compared to the traditional rounds. Thus, it improves penetration which further results in large wound cavities. In addition to that, this product is designed to penetrate clothing such as denim and leather before expanding hence coming in handy in the case of hunting games, because it can go through thick hides and skin. It also has smooth feeding hence enhancing your overall shooting performance. In terms of the primers, it is made of brass construction hence ensuring that it is corrosion-free at all times, when in contact with rain or moisture in the environment. The boxer-style primer on the other hand ensures that it is easily reloadable, in which the old primer can be easily removed and replaced with the new ones. If you’re looking for ammunition in bulks, this products is a must-have for you. The Federal is rather a popular brand in the ammunition industry in which some of its well sought-out cartridges include the Federal American Eagle that is mainly used for self-defense and range training. Conversely, this product is designed for deer hunting. In addition to that, it comes in 200 rounds altogether which really comes in handy if you’re an avid hunter. Ammunition is bulks are not to mention, cheap in terms of price per rounds and will last you about a month or so, depending on how frequent you hunt. The 200 rounds on the other hand are divided into 20 rounds per box and 10 boxes per case. The organized arrangement allows for easy removal of the ammo, when needed. Apart from that, the projectile travels at a muzzle velocity of 2200 fps as well as muzzle energy measuring 1827 ft lbs. All in all, this product consists of a hard-hitting round that promises to deliver great performance in the field. Moving on to the casing, it features the boxer-primed brass casing which contributes to its reloadable as well as non-corrosive characteristics. This is because the brass construction ensures that it is rust-resistant (can be used for all weather conditions) meanwhile the boxer-style primers contributes to the ease of reloading. In other words, the primers can be conveniently removed and replaced, with maximum ease. Weighing 170 grain, it is mainly used for staple hunting as well as target practice ammunition. It features the power-shok soft point round nose (SP RN) design, also known as the soft-point bullet. So, what are the advantages of having this type of design? Firstly, it consists of a jacketed expanding bullet that has a soft metal core. The core is enclosed by an alloy jacket hence producing great expansion when in contact with the target. The great expansion will lead to the wound diameter being greater than the bullet diameter upon impact. Hence, there is deep penetration which comes in handy if you’re targeting medium to large sized games. First and foremost, this product is manufactured by the legendary Remington Arms Company. This product is classified as bulk ammunition, as it comes in a total of 200 rounds altogether. In my opinion, getting them in bulk comes in handy if you’re planning to hunt frequently all day. Not to mention, it is way cheaper per round and you get to fire multiple rounds without worrying about it finishing off. These 200 rounds on the other hand are divided into 20 rounds per box and 10 boxes per case. They are arranged in an orderly manner to allow for easy handling and convenient transportation when off to your hunting spot. Apart from that, the projectile exits the muzzle and travels at a velocity of 2390 fps, together with muzzle energy measuring 1902 ft lbs. In addition to that, the theory is rather straightforward where the heavier the bullet, the higher the energy and velocity which will result in a more devastating result. By devastating results, I mean that the bullet will have enough energy and velocity to penetrate deep into the flesh and hide of your target, and reach its vital organs for a quick kill. That being said, it is designed to be used for wild boar hunting as well as deer hunting. The casing on the other hand is boxer-primed brass therefore leading to its non-corrosive as well as reloadable characteristics. Just so you know, the boxer-style primers are very popular in the United States. Weighing 150 grain, this .30-30 ammunition features the Core-Lokt soft point design which provides controlled expansion. In other words, it consists of a tapered copper jacket that is locked to a lead core hence resulting in controlled expansion as well as high weight retention which comes in handy when dealing with larger games. Furthermore, the soft point version of the Core-Lokt design comes with a broad frontal area which contributes to rapid expansion and high energy impact. In other words, the ‘Lokt’ design bullet cores provides deeper penetration. Meanwhile, the jackets are designed for reliable expansion to almost twice the original bullet diameter. Designed and developed by the well-known brand, Winchester, this ammunition features the supreme ballistic silvertip ammo. In terms of bullet specifications, it weighs 150 grains and is of the ballistic silvertip type, with a ballistic coefficient of 0.23. So, you may be wondering what made it popular? Firstly, some of its characteristics include having a polymer tip and an alloyed lead core. Apart from that, it comes with a contoured jacket as well as the Lubalox (black oxide) coating which comes in handy to ensure that it is corrosion-free, hence able to be used under all weather conditions. The bullet design ensures rapid controlled expansion which is important so the jacket and core stays intact upon impact as well as has a great penetration. Good penetration is essential, especially if you’re targeting larger games because it needs to penetrate the hide and flesh of the game (good for big game, thin skin) to reach its vital organs, to deliver a quick kill. Another factor that influences the penetration is the muzzle velocity and energy. The muzzle energy of this product measures 1902 ft lbs meanwhile its muzzle velocity measures 2053 fps. In addition to that, it includes 20 rounds per box altogether. These 20 rounds are arranged orderly in trays, in the box to ensure easy transportation as well as convenient handling and removal of the rounds when needed. Not only that, the composition is lead-free so it can be used in any states, especially in lead-prohibited areas. Furthermore, the casing is boxer-primed. In other words, it can be conveniently reloaded, so you can remove and replace the old and used up primers with new ones, just by a simple pin punch. This type of casing ensures non-corrosive as well as reloadable characteristics. For your information, primers are extremely essential as they function to ignite your powder charge. The Federal Fusion cartridges are mainly used for hunting purposes. They are electrochemically joined with pure copper to form an extreme pressure core, thus ensuring an optimum performance down-range. That being said, it further results in high terminal energy upon impact as well as radiated shock throughout the target. Moreover, there are 20 cartridges per box where they are arranged orderly to ensure simple handling and removal, for your added convenience. If you’re an avid hunter, I suggest that you get ammunition in bulks because then it would be really worth it because you get it at a cheaper price per round as it will last you a long time. The bullet type on the other hand is bonded. In other words, bonded cartridges prevents the jacket and core from separating upon impact. Instead, they are held together for improved weight retention, hence leading to deeper wound channels and penetration. As a result of that, they are mainly used when targeting larger games. This is because when dealing with larger games, deeper penetration is required so that the projectile can penetrate the thick skin of the game and reach its organs to deliver a quick blow. In addition to that, the muzzle energy and velocity also contributes to the penetration where the higher the energy and velocity, the deeper the penetration. Speaking of the energy and velocity, the bullet exits the muzzle and travels at a velocity measuring 2200 fps, together with 1825 ft lbs muzzle energy. The theory is such that the heavier the bullet, the higher the energy and velocity which further contributes to a devastating result upon entering the target. In terms of bullet casing on the other hand, it is of the boxer-primed style in which it is reloadable with maximum ease. All you have to do is remove and replace the old primer with the new one, with a simple pin punch and voila, you’re good to go. Firstly, the bullet weight is measured in unit grains. The bullet weight plays an important role in the penetration. But since they are over 100 grains for all the products below, it can be used for medium to large sized game hunting, according to your preference. Just so you know, the ones with below 90 grains is suitable to be used for varmint hunting. Moving on to the type, there are many types and designs out there, it all depends on your personal preference. You can check out the guide here. The most common primer style is the boxer-style primers. They are usually made of brass construction hence ensuring it is non-corrosive when in contact with rainy weathers or moisture. For your information, the boxer-primers are the most popular priming method in the United States. The plus point of using this type of primers is that it is reloadable. In other words, the old primers can be removed and replaced with the new ones, with maximum ease. All in all, the .30-30 Winchester ammunition is a rifle cartridge. If you’re a lever action rifle fan, this product is a must-have for you because they are mostly chambered in those type of rifles that comes with a tubular magazine. In terms of choosing the cartridges, it solely depends on the number of rounds as well as the bullet type, design and weight you prefer. Therefore, I hope my review assists you in making the right choice. Happy hunting and don’t forget to get yourself a hunting jacket!